Sorry but I did read the instructions but the images before I condensed them were rejected as being too large. 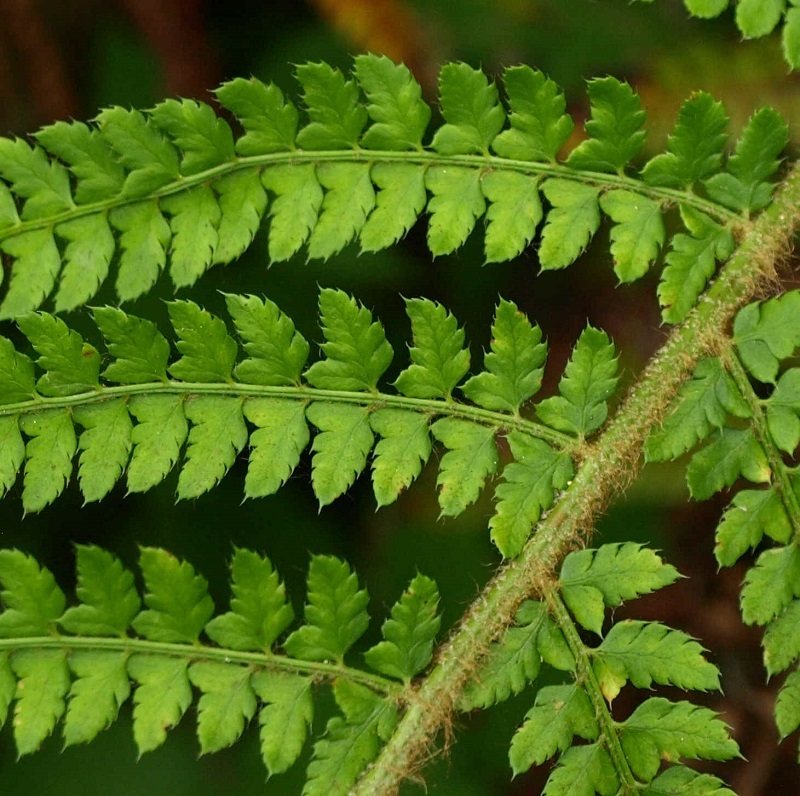 I think that this is Polystichum setiferum, the soft shield fern. Polystichums have a lobe at the base of the pinnule that looks a bit like the ‘thumb’ on a mitten. They have round indusia (the cover over the spore cases) with a central dot where the indusium is attached to the lamina. 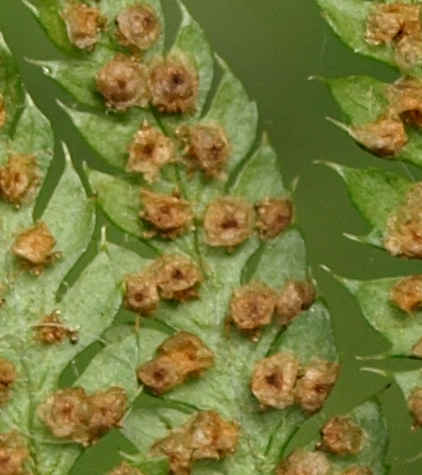 I hope I have attached a close up of the pinnules – does this fit with your plant? Here is a picture of the indusia. Hi Roger, thank you for your query, the two Polystichums can be difficult to separate. You need to look at several fronds and a range of characteristics to get a feel for the local population. Look at the shape of the frond. 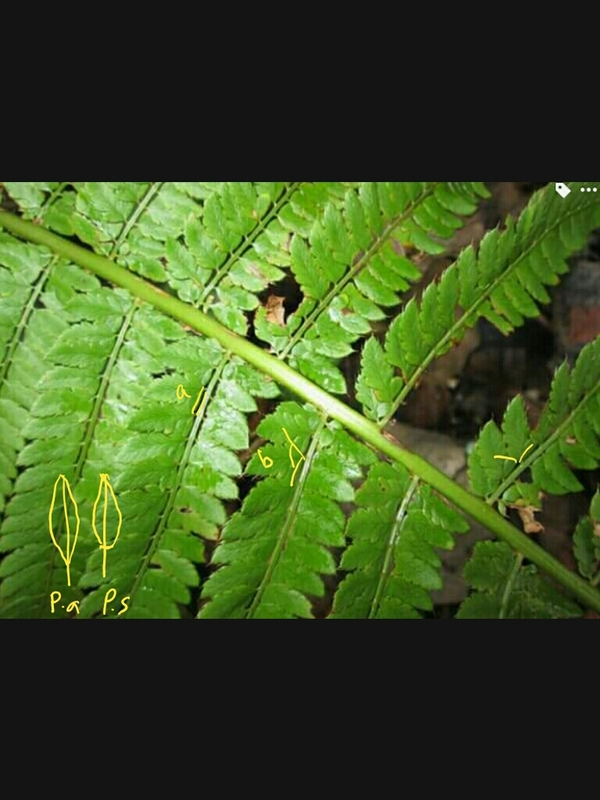 In P. aculeatum the frond tapers almost all the way down, in P. setiferum the pinules stop more abruptly and there is a good length of pinnule free stipe. Apparently P.a is leathery and P.s is soft but I sometimes struggle with this when in isolation. More reliable is the angle at the base of each pinnulete (b) on my picture. It is obtuse (>90°) in setiferum, acute (<90°) in aculeatum. I often find the gap (a) is parallel in setiferum, but V shaped in aculeatum. Now the snow has arrived recheck the fronds. Aculeatum remains green but setiferum dies away. I hope that helps. Are you local to Loggerheads? Thank you to Andrew, Alison and David. Sorry my images turned out to be too small. Have cropped and resized one to show sori that may help better. I have been struggling with fern identification for too many years so appreciate your help. And David I live in Chester but regularly visit Loggerheads.